A habit changing device for measuring and improving hospital hygiene. In Europe alone 4 million Hospital Acquired Infections (HAI’s) occur every year, and in 30% of the cases, the hand-hygiene of the medical workers are to blame. Sani Nudge set out to eliminate HAI’s, with their first step being to focus on the hand hygiene of healthcare workers. Their approach is to use nudge theory and analytics, in order to empower hospitals to measurably improve their hygiene compliance. Aarhus and Bispebjerg Hospitals (in Denmark) have been using the service since 2017. In theory, a healthcare worker is supposed to clean their hands before and after any patient interaction, but in practice this is often forgotten. The Sani Sensor sends out a visual ‘nudge’ each time a healthcare worker passes in or out of this ‘patient zone’ in order to remind them to clean their hands. Anonymous ID sensors allow the system to measure and visualise hygiene analytics based on a variety of factors including time, place, person, etc. The sensor is battery powered, and is easily attached to all existing dispensers, meaning that it is seamlessly integrated into the hospital’s existing routine and ecosystem. 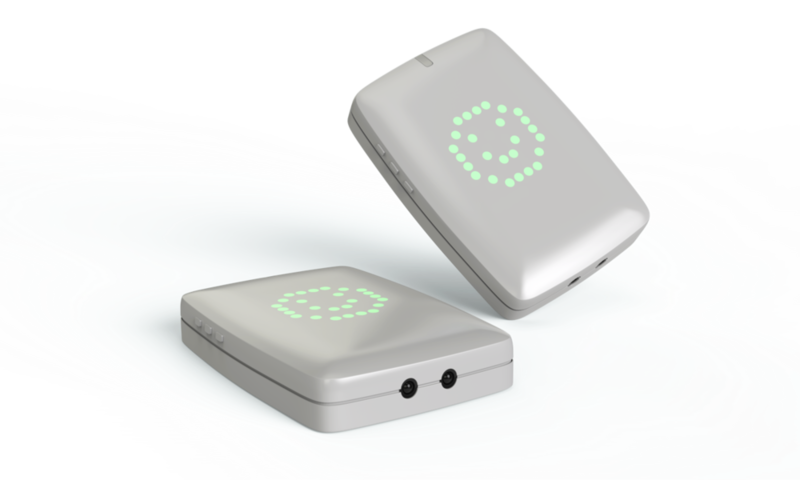 While I was working for Jakob Wagner, Sani Nudge approached him to re-design their sensor. The initial brief had been to solely improve the aesthetics, without changing the ‘nudge signal’ itself. However, we believed that the physical form had to be designed hand in hand with the ‘signal’ that it had to transmit. In order to limit battery use, we were constrained to a single coloured 8x8 LED matrix to create the signal. We realised we could use LED light guides to reconfigure where the lights showed up on the device’s surface. This meant that instead of a square ‘screen’, we instead started to explore how the light could become an integrated part of form. After some static sketches, I animated the nudges to understand the effect of time and movement on the nudge. The convex body allows the nudge to be seen from multiple sides, and keeps the sensor visually ‘light’ whilst affording enough space for the batteries inside.